I love knitweave. 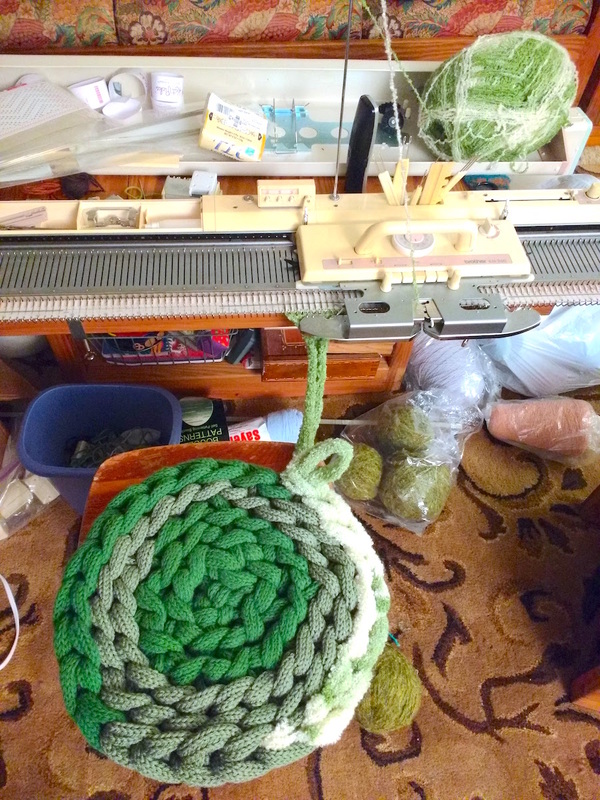 I think it’s a vastly underutilized machine knitting capability. I have only begun to explore it, but hope to do so much more. 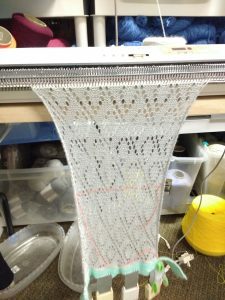 I love that it creates a fabric that is completely different from most other sorts we create on our knitting machines. 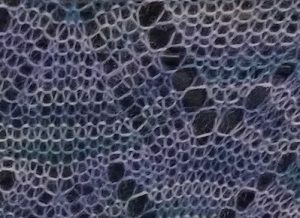 It resembles a woven fabric in so many ways. 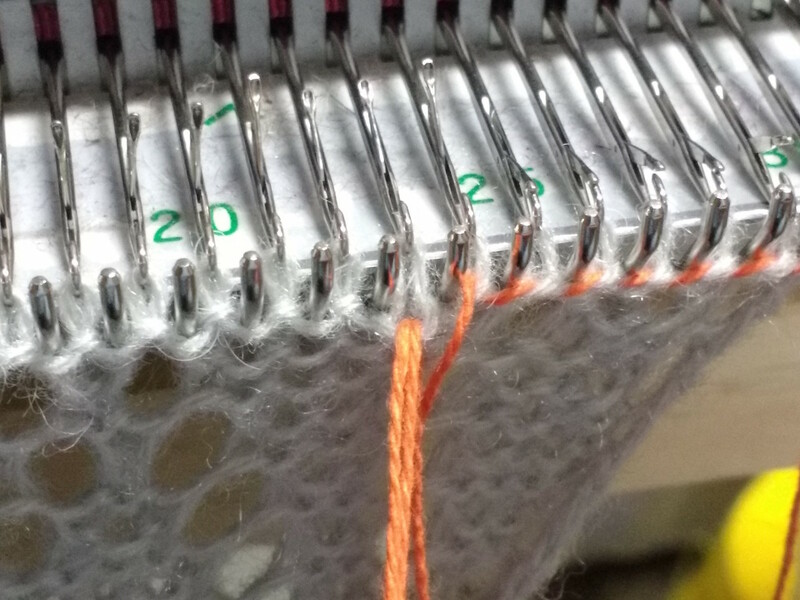 It makes me think about how our knitting machines share so much heritage in common with weaving looms, the origins of our punch cards going right back to the early patterning cards of the Jacquard looms. 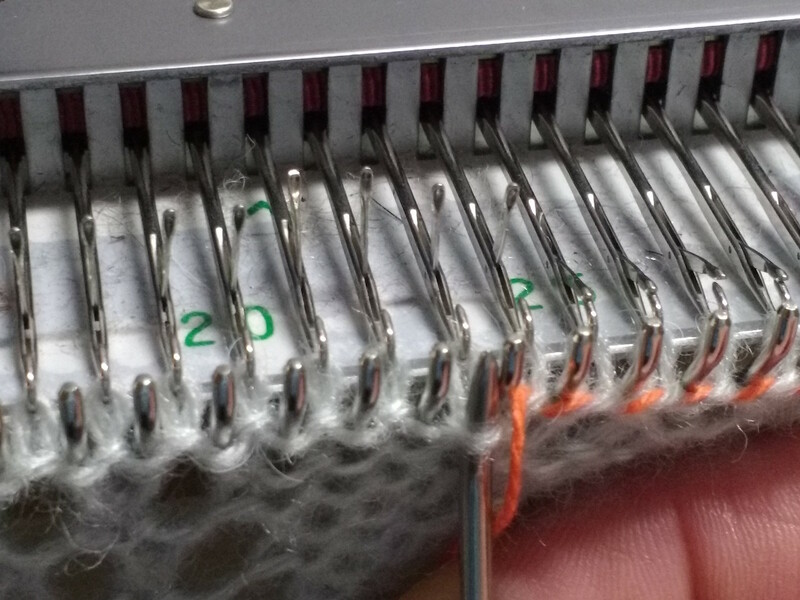 Have you tried knitweave on your machine? Marianne Henio has created a lovely pattern for a very smart knitweave jacket, a bit in the Chanel style. I can’t wait to try it. I guess I loved it just as much back in 2016, when I first purchased the pattern, and still love it so much that I purchased the pattern again this week! Oops. My error can be your gain. 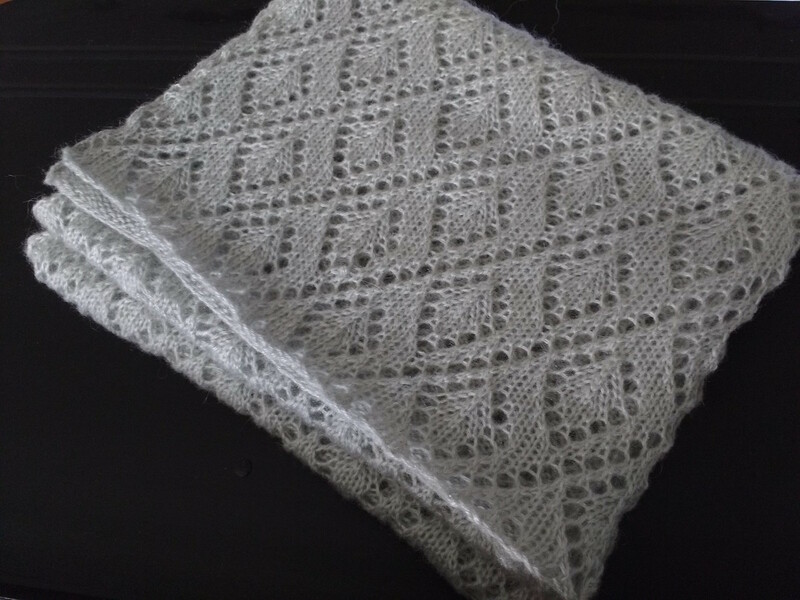 Marianne has kindly allowed me to pass on my ‘extra’ pattern to another knitter. Simply make a comment in the “Leave a Reply” section below. To qualify for the drawing, tell me what machine you knit on. I will accept comments until September 30. 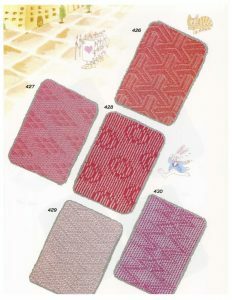 At that time I will close off comments and randomly select one commenter to receive the pattern from Marianne. 2. 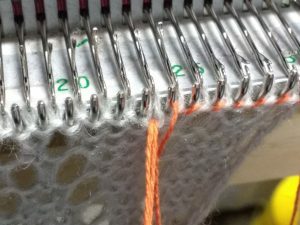 Tips and Tricks for Optimizing Graphic Images for Knitting – This will be a computer-based workshop. 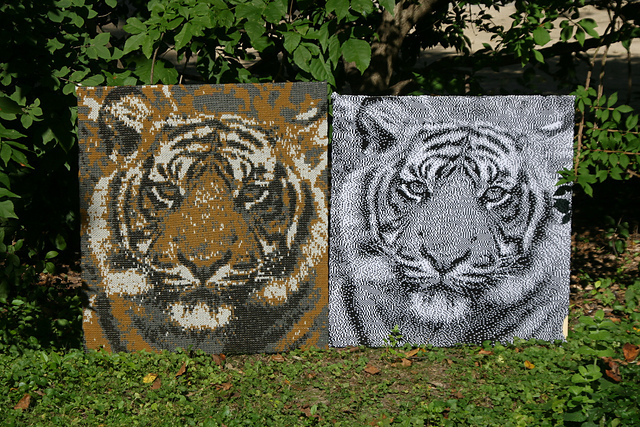 I will be demonstrating many ways of manipulating an image to optimize it for knitting. 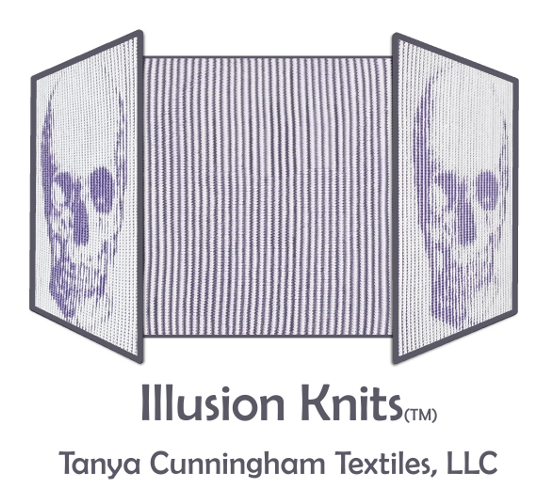 Mostly I want to encourage you to dig into your graphics program (whichever one you like using) and explore and experiment to find ways of altering images for knitting. 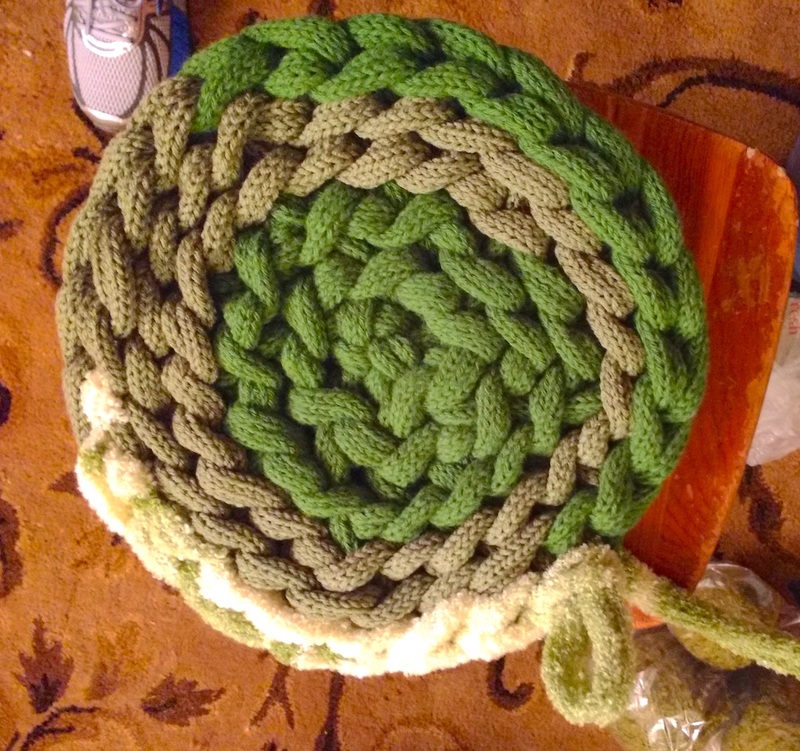 So I dragged out one of my bulky machines, and some bulky yarn from my stash and made a start on the project. 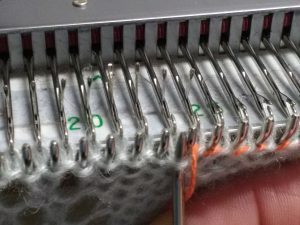 This is probably the easiest, least intimidating way possible for people who have no prior experience with machine knitting to get a little hands on time at the machine. It’s a pretty bomb-proof project. 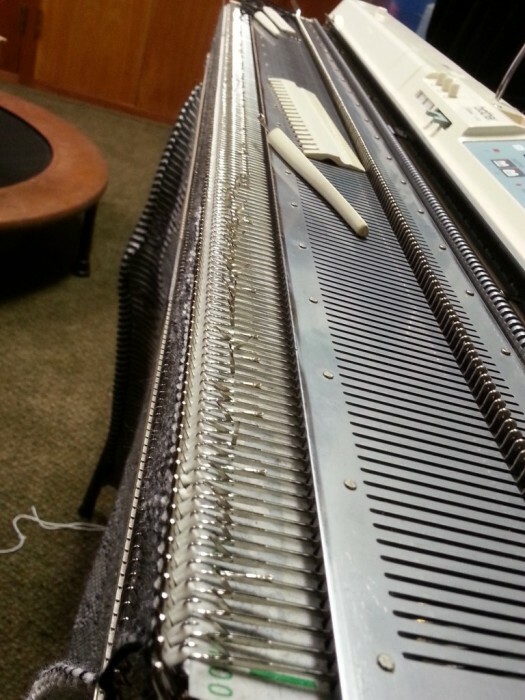 I just set up a piece that’s 8 stitches wide, and knit, knit, knit. 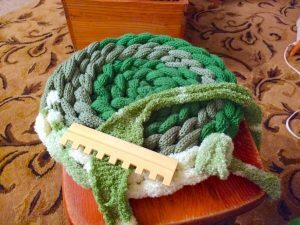 Add more yarn and knit, knit, knit some more. 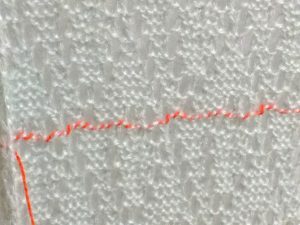 Even if stitches get dropped, even if the whole thing drops off the machine, it’s easy-peasy to just rip back a few rows and put the 8 stitches back on the needles. Since the stockinette knitting naturally curls at the edges, it creates a sort of tube structure all on its own. I then take that super sized tube and use it to crochet round and round, creating a little rug, or chair cushion, or meditation mat, or pet bed. No additional tools needed, I simply use my fingers to pull the loops through. It makes a yummy, cushy structure that is lovely under the toes. I did a similar demonstration some time back at the Madison Children’s Museum – Knitting Kids’ Art. 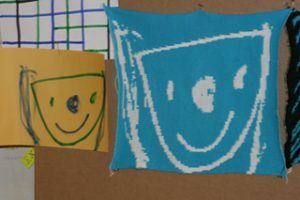 I had the kids draw pictures with markers, and then I chose a few to knit. The staff then helped out by making them into little pillows, which they eventually hung from the ceiling in a semi-permanent display. I had a blast doing this project, and I think it turned out really well. We’ll see if others feel the same way. I’m hoping that people jump right in and knit lots. I think it’s fun for people to participate, and see something ‘real’ being made from their efforts. How about you? Do you like to jump in to hands on demonstrations? I have always loved knitting lace, whether by hand or on the knitting machine. 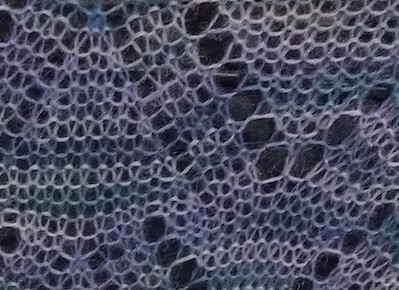 I love the mathematical precision of the patterns, the astonishing designs that can be achieved simply by placing holes and doubling stitches at defined intervals. Most of all, though, I love the thrill of the ‘reveal’. Once all the knitting i s done, and you take what is a crumpled pile of yarn all looped together and block it to open up the fabric and make it lie flat, it’s one of those ‘chorus of angels’ moments. I am transported by the beauty of it, every time. 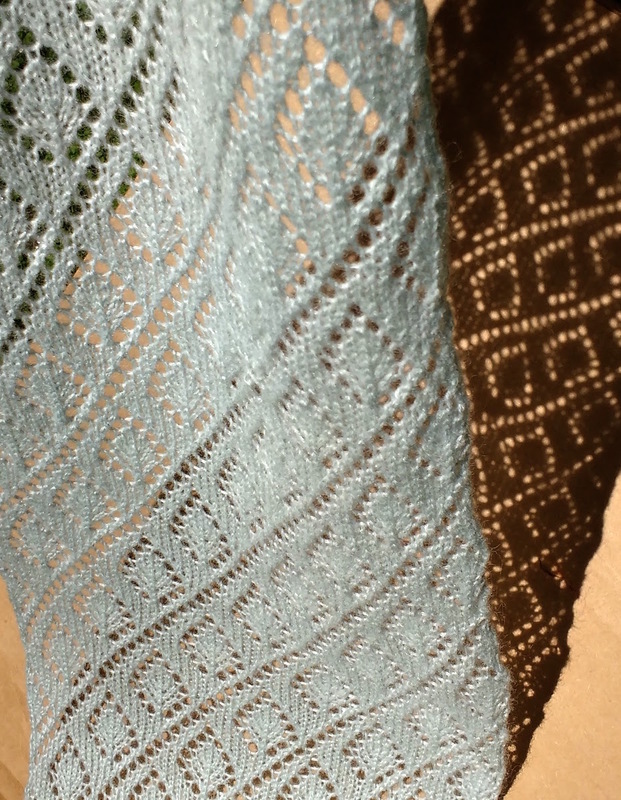 As with so many techniques at the knitting machine, lace can be both a joy and a terror. With automatic needle selection it is ever a thrill to watch the myriad littles holes being created as you operate the lace carriage back and forth, back and forth, transferring stitches from one needle to the next and then knitting across to create the many yarn overs (as they are called in hand knitting) that will leave behind precisely placed holes that are another row in your lace design. All good and wonderful, until . . . dun, dun, duhhhhhhh! 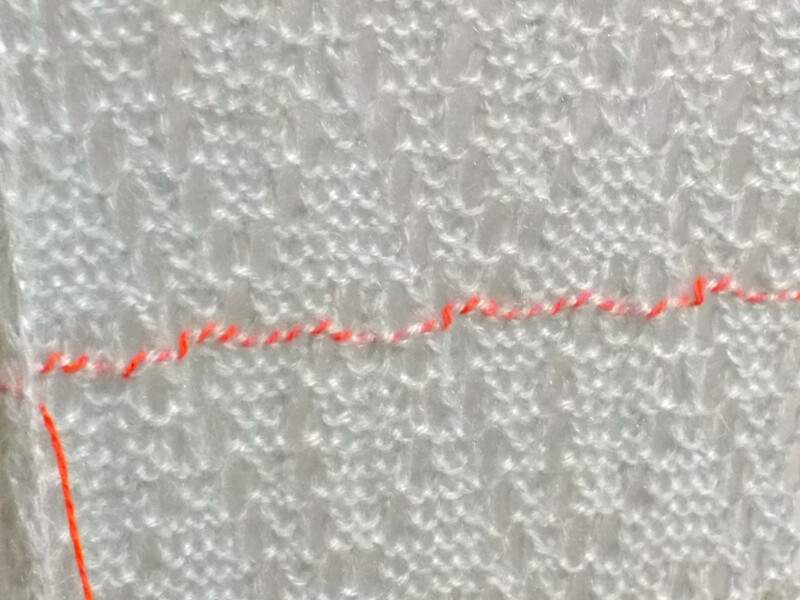 a dropped stitch. 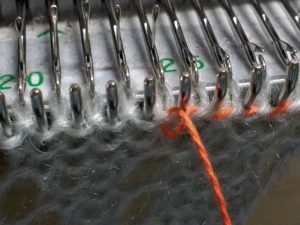 Because the fabric is always stretched taut from side-to-side, with hanging weights pulling down, a dropped stitch can run very quickly down the work. 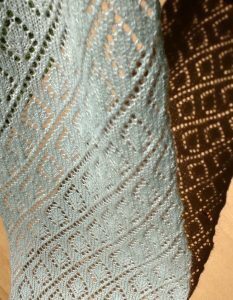 And while other kinds of knitting can be ripped back and placed back on the machine, this can often be nearly impossible with lace. Enter the lifeline. Used in both hand and machine knitting, the lifeline is a separate piece of cord or yarn that is threaded through one complete row of stitches. 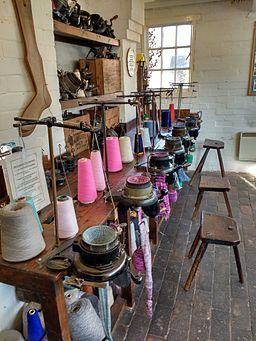 It serves the dual purpose of stopping a run dead in it’s tracks, and providing a stable row of knitting that can be rehung in the needles so that the entire piece doesn’t have to be scrapped. However, weaving the lifeline in does take some time, so it’s an inconvenience. 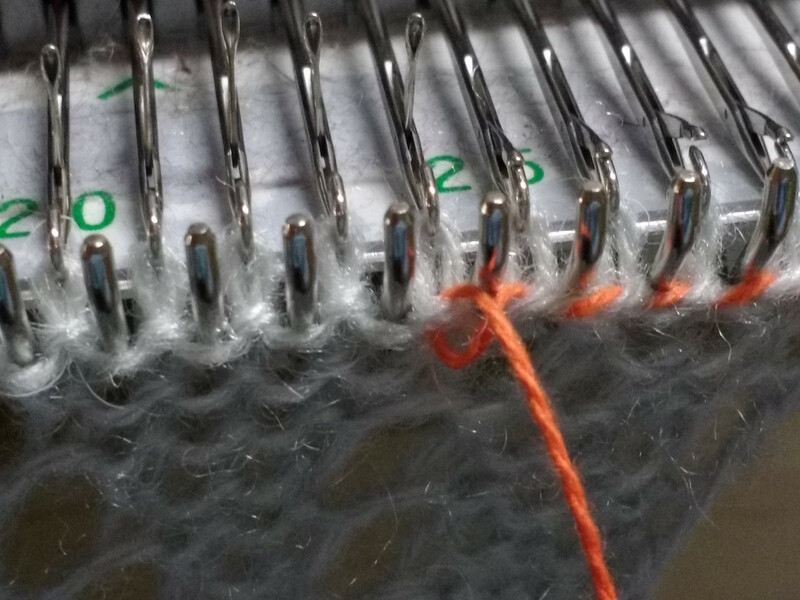 The balance one must strike is between the time spent putting in lifelines (ie how often to put a new one in) and risk of a dropped stitch and having to unravel the knitting to the previous lifeline, or even the beginning of the piece and starting over. Here is my technique for inserting a lifeline. (There are other techniques equally valid.) The thing to keep in mind is that a lifeline cannot simply be knitted into the fabric along with the regular yarn, as it would also run, right along with the regular yarn if a stitch is dropped. Try to put the lifeline in on a knitted row. This assures you will get all the stitches, and make it much, much easier to rehang if necessary. 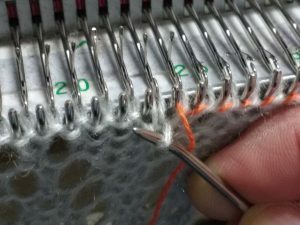 Thread up a needle with a firm cord or yarn and bring the needle up from below into each heel below the active stitch. Here’s another view showing the tip of the needle pulling out on the heel stitch below the active stitch. The lifeline is in place, time to add a new one.